What is Ultra VPL™ Pulsed Light? Ultra VPL™ uses evolved light technology to deliver a sequence of rapid pulses of light energy to the skin for hair reduction and skin rejuvenation. Unlike other pulsed light devices, the Ultra VPL™ carefully balances the number, length and frequency of the individual pulses of light within each visible shot – hence the term Variable Pulsed Light. Ultra VPL™ treatments are not invasive, and the unique variable pulses have been clinically proven to achieve fantastic results on hair removal and successfully treat a wide a variety of skin imperfections. Unwanted hair from all parts of the face and body: The Ultra VPL™ treatment has been clinically proven to remove hair from all parts of the face and body. Laser and Pulsed Light (VPL) Hair Removal is still the most requested aesthetic treatment in clinics and salons worldwide - it is a safe and proven method for the long term removal of unwanted hair, supported by numerous clinical studies. When it comes to laser and light-based hair removal, UK Manufacturer Energist is a name you can trust - We have been designing and manufacturing hair removal lasers and IPL systems for more than 15 years - in fact, among our directors we have one of the original team who discovered that lasers could be effective for hair removal. All of our lasers & pulsed light systems, which are used by professionals worldwide, are FDA cleared and pass stringent testing and inspections to be badged as CE marked medical products. Both laser and pulsed light systems are suitable for the effective, long term removal of unwanted hair, and being at the forefront of both technologies Energist has developed advanced technologies to maximize the comfort, speed and effectiveness of the treatment, whatever your skin tone. Ultra VPL™ treatments are very effective, achieving outstanding results time after time. *Names have been changed to protect the identity of Ultra VPL™ clients. Therapist– Before the 3rd treatment hairs were left for 3 months ensuring best possible end results were achieved. Client had fortnightly waxing for over 10 years. Now waxes 3 or 4 times a year. Client– “It is such a relief not to have to worry about my underarm hair anymore”. 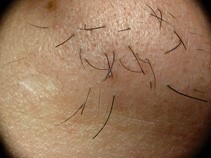 Close-up shots enables a follicle count to be undertaken to demonstrate reduction in hair density. Q: What makes this System special? A: Traditionally, most cosmetic procedures have been associated with lasers. As technology has progressed, research has shown that Intense Pulsed Light units, and in particular Variable Pulsed Light (VPL™) Systems, are regularly producing better results than the laser systems originally available. Pulsed Light units are non-laser, emitting light across a broad range of wavelengths that are preferentially absorbed by the appropriate structure in the skin. The Energist ULTRA™ System is designed such that each light pulse comprises a number of rapid shorter pulses. These 'variable pulses' ensure more controlled absorption by the appropriate structures whilst minimising heating of the surrounding skin. This means that a greater range of hair and skin types can be safely and effectively treated than was previously possible. A: Depending upon the treatment being carried out, light emitted from the Energist ULTRA™ System is preferentially absorbed by the specific structure in the skin. For hair removal, the melanin in the hair absorbs this light and is heated to a temperature that permanently inhibits the hair's ability to re-grow. For skin rejuvenation, improvement and therapy, various structures can absorb the light and repair the damage caused by ageing and the sun. A: The Energist ULTRA™ System has been designed to provide both safe and effective hair removal and skin rejuvenation treatments. Hair Removal: Unwanted hair can be removed from all parts of the body, including legs, chin, upper lip, bikini line, underarm, back and chest. Grey and white hair can’t be removed permanently, as the hair must have a pigment. Skin Rejuvenation: Many skin complaints caused by ageing and sun damage can be successfully treated using the yellow light produced by the Energist ULTRA™ System. This includes redness (rossacea), age spots, freckles, pigment changes, acne, skin texture and fine lines. Q: What is the treatment procedure? The area to be treated will be prepared and the applicator head will be moved across in steps to ensure complete coverage. Due to the large applicator head treatments can be performed quickly, which we know is important with today's hectic lifestyle. Q: Is there anything I need to do prior to, or after, treatment? A: It is advisable to stay out of the sun, and away from tanning beds, for at least 4 weeks prior to any treatment to ensure that your skin is as close as possible to its natural colour. You must ensure that all cosmetics are removed from the treatment area with a good cleanser and then allow the skin to settle. As the skin may be slightly more sensitive post-treatment it is recommended to use skin products developed for sensitive skin and again avoid sunbathing or tanning beds for several weeks. A: The light output from the applicator is preferentially absorbed by the melanin in the hair. This then heats up the hair follicle and disables the hair's germination cells so it cannot grow back. A: This procedure works well on the face, neck, chest, arms, back, under arms, legs and bikini line, amongst other areas. Q: Which hairs cannot be treated? A: Hairs that are not in the active growth stage cannot be treated. Blonde, red and grey hairs are more difficult to remove and will take longer to treat. A: Due to the special parameters used there are little or no side-effects. The treatment has been likened to being flicked by a hair brush, but the skin may go slightly red for a few hours. If the area is over treated then there may be a chance of some slight crusting and blisters, however, this will resolve in 5 to 7 days. A: In most cases you will see a significant result after 3 treatments but there is a significant improvement if the treatment is repeated at regular intervals, normally 4 - 8 treatments are required. There is no limit to the number of treatments you can undergo. 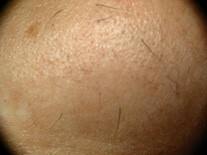 After treatment it will appear that the hairs continue to grow. What is actually happening is that the hair is still gripped by the skin and is slowly being expelled from the follicle. A: As the process is designed to reduce the density of the hair growth you will start to see results after your first/second treatment. Because you see yourself everyday it is difficult for you to see gradual improvements taking place. Thus, it is very important that good close-up photos are taken before the treatment and then upon review at three months, this will then show the improvement. A: After the initial treatment it is advisable to have a second treatment four weeks later. The hair can only be removed when it is in its active growing stage - anagen, therefore a series of treatments is required to catch the hairs in this cycle. Not all hairs are in the same cycle at the same given time. A: There is no maximum number of treatments that may be undertaken. A: It is important to understand that there are numerous hair follicles in every square centimetre of skin on the body, for example, the chin has approximately 455 follicles per cm 2 and the thigh about 55 follicles per cm 2. As you can see, where we might have disabled a hair follicle there are adjacent ones that might not have been treated in the correct phase of hair growth and may grow through at any time. A: Virtually anybody can be treated with this system. However, any underlying medical conditions may exclude you from treatment or the results may be negligible. It is very important that you state clearly any medical conditions that you have or any medical treatments you are undertaking. Q: What photo skin types can be treated? A: Fitzpatrick Skin type’s I-V are safely treated with no reports of any adverse affects on type VI skin. 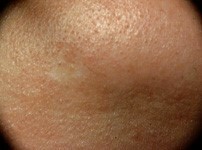 However, it is not recommended to treat Type VI skin.